In my first post, I outlined the process of how to build an Igloo Cube Cooler Mash Tun, using stainless steel braid as a filter media. While the stainless braid works very well, you do have to be careful when stirring the mash not to damage the braid. 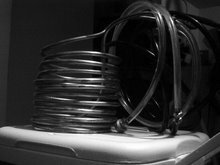 Because of that, I decided to build a grain filter manifold out of copper tubing and this post explains what I did. The picture to the upper right shows how these pieces were placed to create the manifold. The single 2 inch piece is going to be used to attach the filter manifold to the output valve. Since the valve is slightly higher than the cooler bottom, you will need to put a slight bend in it. I did this by taking a short piece of 3/8 steel rod and putting it in the bench vise. Then take the copper 2 inch piece of copper tube and place about an inch over the rod sticking out from the vise. Then take a longer piece of 3/8 steel rod and put in the remaining end of the 2 inch piece of copper, applying downward pressure to bend the copper. 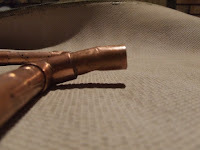 It's a good idea to go slow and test fit by putting one end of the piece in one of the copper tees and the other into the valve fitting, bending little by little. Once the tee sits on the cooler bottom, you've got the bend you need. For each of the remaining straight pieces, I then used a small drill bit to drill multiple holes in each piece. It works well if you put a piece of scrap wood underneath so you can drill through straight through, creating 2 holes at once. Try to keep the number of holes uniform across each piece to create a balanced flow. Drill holes evenly until you get the drain flow you want by testing periodically. Any burrs on created on the outside of the copper due to drilling can be removed using a file. You can reference the assembled copper manifold (above left) to see the holes in the copper tubing. I didn't drill any holes in the elbows or tees but that could be done as well. If you plan on using the valve to regulate flow, you can drill many more holes in the manifold than I did. Right is the finished copper manifold assembled and installed in the cooler mash/lauter tun. I didn't use any solder to sweat th e pieces together, but found a good tap from a hammer on all of the ends and elbows creates a pretty tight fit. If needed, it also makes it possible to disassemble in the future for cleaning or storage. If you have questions regarding the installation of the ball valve, please reference the original post which includes detailed mash tun conversion instructions. How did you attach the manifold to the spigot on the inside. What is keeping it from leaking? The manifold was just inserted into the female nut used in the original mash tun build that holds the ball valve in place. The inside diameter of the nut, matches the outside diameter of the copper perfectly creating a snug fit. I've never tested it for leaks, since the majority of the time, the entire manifold is under water, and the liquid will take the path of least resistance which is out of the tun when the ball valve is opened. Any reason for copper over hot/cold PVC, same stuff as used for the T? There is debate around using PVC and it possibly leaching unwanted chemicals into your brew. Since I'm not an expert on plastics I'd have to do some research on it, but that is why I tried to minimize the amount of PVC in my design. I think there are different grades of PVC, so you may be able to find one that will work fine. 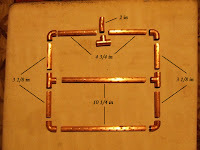 I have seen several pictures of mash tuns using PVC, I just erred on the side of caution and built mine out of copper. Also, any copper that makes it into your wort is actually used by the yeast as a nutrient during fermentation! When using copper though do remember, if it starts out dull and stained and ends up nice and shiny after the brew, all that gunk is in your beer, so keep the copper clean. Thanks Gaz! Good to know that others are getting use out of my homebrew projects! After searching the internet for a design, I settled on yours. It works great! Thanks for the detailed info. I'm about to try your design. Do you ever have problems with the manifold holes getting clogged? Which drill bit size did you use? I can't remember the exact size but it is either 1/16 or 5/64. I haven't had any problems with clogging. The smaller and more holes the better. Why did you put holes on the top of the manifold? With my manifolds I have put holes only on the bottom with excellent results. Also, I have found both in research and experience that 5/64" holes work great for manifolds. Our pneumatic factory was founded in 2000,CHECK HERE. In decades of serving China pneumatic industry, we have built our reputation on product knowledge, world class suppliers, application support, and value add services. Our commitment to our employees, customers and vendors is the core of our business beliefs. In our factory, there are more than 80 front-line workers, 3000 squares working shop.Our main products are air Pneumatic Cylinder, solenoid valve and also a lot of pneumatic fittings like Air Gun.